Workers at Opel's Bochum factory, shown, fear they'll suffer if parent GM keeps a plant in Antwerp, Belgium, open. RUESSELSHEIM -- Employees at Opel's Bochum factory in Germany are at risk of becoming the losers in the automaker's Europewide restructuring. Through June, four extra shifts for the Opel Insignia have been scheduled at the carmaker's Ruesselsheim, Germany, factory, and 17 for the new Astra in Gliwice, Poland. But about 4,600 Bochum employees will spend about 100 days working shorter hours this year. The new Zafira minivan will bring an improvement, but not until next year. "We are calling for a fair division of work," said Rainer Einenkel, Bochum's labor leader. "We can't have one factory continuously running special shifts while we work reduced hours at Bochum." Bochum workers are also worried that GM could reverse a decision to close its plant in Antwerp, Belgium. 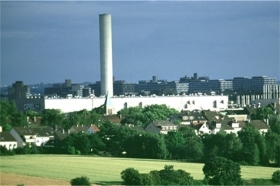 The closure is expected to lead to more production work in Bochum. Opel's European labor representatives are striving to save the facility. Einenkel said if Antwerp is saved, GM must find other ways to boost production at the Bochum plant.